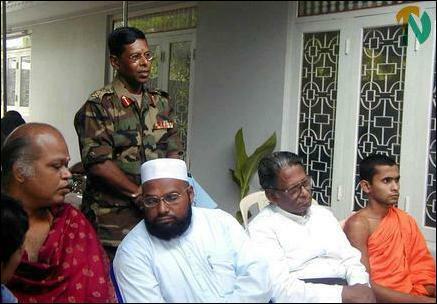 "We do not want a naval base in Trincomalee. We have come to Trincomalee to respond to the needs of all three communities in the Trincomalee district and to assist them in support of the current peace process," said the U.S. Ambassador in Sri Lanka, Mr. Jeffrey J.Lunstead, addressing the opening event of the Trincomalee office of the USAID's Office of Transition Initiatives (OTI) held Wednesday morning. Starting his speech by greeting those present at the occasion in Sinhala, Tamil and Arabic ("Ayubowan", “Vannakam" and "Aslam Alaikum"), the Ambassador said, "The Sri Lankan government and people have been working for peace. The U.S. can help them in the peace building process. Peace and development are interlinked." "USAID/OTI’s presence in Trincomalee allows us to address community-identified needs in Trincomalee district and to respond to those needs in a timely manner. Our goal is to bring tangible peace dividends to war-weary communities," said Mr. Lunstead. Regional Program Manager of the USAID/OTI office in Trincomalee, Ms. Brenda Barrett, in her welcome address outlined the activities of the OIT. "It works to provide short-term assistance targeted at key transition needs. It primarily helps local institutions, such as NGOs, student groups, the media and civil organizations to advance peaceful political change," she said. Mr.Lunstead and his wife are received at the entrance to the office of USAID/OTI by regional program manager Ms. Brenda Barrett ( extreme right) and Programme development Officer, Mr Thiagarajah Murallidaran (extreme left). Second from left is USAID/OTI Country Representative, Mr.Justin W.Sherman. She added that through OTI, fifteen grants valued at about 20 million rupees have been given to nine non-governmental and community based organizations and equally distributed to all three communities in the Trincomalee district. At a discussion later held with the participants, Trincomalee district General Officer Commanding of the Sri Lanka Army, Major General Sunil Tennekoon, told the US Ambassador that Trincomalee district is playing a unique role in the east as all three communities live in equal strength and needed a special attention in promoting peace effort. Eastern Provincial Deputy Inspector General of Police, Mr. Neville Wijesinghe, said that community leaders of all races and faiths should be consulted when implementing development projects in the districts. 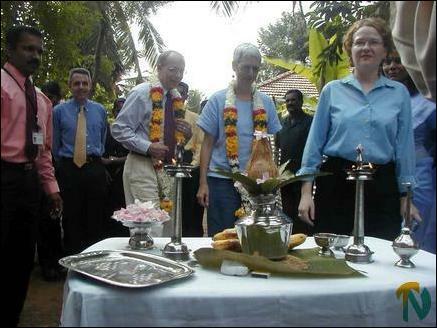 Mr.Lunstead is seen lighting the traditional oil lamp. Ms. Brenda Barrett is also seen. Religious leaders of all faiths were present at the occasion and offered their blessings. 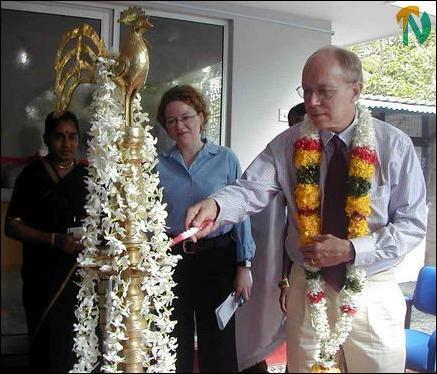 Mr. Lunstead lit the traditional oil lamp and declared open the new USAID's OTI office by cutting the ribbon. The U.S. Embassy in Sri Lanka later said in a press release, "USAID/OTI has opened two new offices in the eastern province in Sri Lanka this week. The new offices located in Trincomalee and Amparai allow USAID/OTI to expand its grant making activities in areas where it can be most effective—[areas with] ethnically diverse communities where there [are] great opportunities for conflict mitigation and management. By being in closer contact with local communities, the staff of the two new offices can better understand local issues and form strong partnerships with community based organizations." 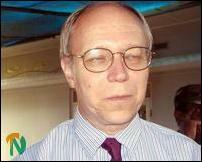 "The USAID-OTI offices have already begun making grants. From Amparai, 23 grants with a value of $ 377,000 have been made, and the Trincomalee office has made 14 grants valued at $ 230,000. Since March 2003, USAID/OTI's flexible and fast small grants program in Sri Lanka has made 88 grants totaling US $ 2.22 million," said the press release. The release further said, " USAID/OTI's Sri Lanka program assists in generating greater support for a negotiated peace settlement that will end the long-standing conflict in Sri Lanka. To accomplish this goal, OTI aims to demonstrate tangible benefits of peace, increase the exchange of information and diverse points of view on peace issues among various levels of society and communities, and reduce or prevent incidents of violence in conflict-prone communities. USAID/Sri Lanka seeks to promote sustainable, broad based human development through growth in the country." Trincomalee district General Officer Commanding of the Sri Lanka Army, Major General Sunil Tennekoon, speaking at the opening event ofthe USAID-OTI office in Trincomalee and religious leaders of all four faiths are seated in front after blessing the occasion.